Club Penguin, the #1 virtual world for kids on web and mobile, has been taken over by the evil Empire, and it is up to penguin citizens to join the growing rebellion and strike back against the Imperial forces. For a limited time starting January 22, Club Penguin will be transformed into Lothal, home planet of the hit Star Wars Rebels™ TV show, and players are challenged to prove their skills in a variety of special Star Wars Rebels quests to save the Island. As they fight the evil Empire, members will be able to dress up in new Star Wars™-themed outfits like Agent Kallus, Vizago, R2-D2 helmets for puffles and many more. Throughout the event, players will be tasked with missions from Ezra Bridger, Zeb Orrelios, Hera Syndulla, and Kanan Jarrus of the Ghost crew and earn special Star Wars Rebels-themed items along the way. Members can use their virtual coins to buy Star Wars-themed outfits from the Penguin Style catalog, shop for galactic furniture and igloos and earn special Star Wars Rebels costumes for their efforts. Members will also be able to earn different Lightsabers™ with unique moves that they can use in epic duels. Once proving their rebellious skills to the Ghost crew by completing special tasks, players must ultimately take on the nefarious Inquisitor. 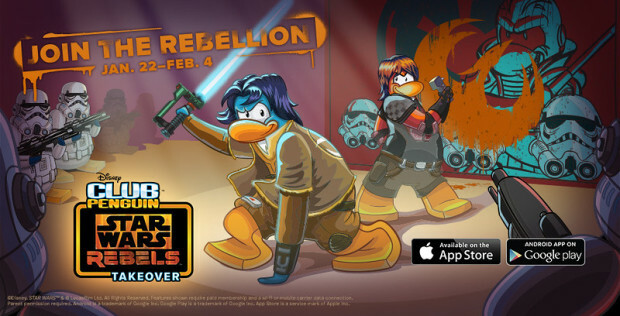 Players can join the rebellion from January 22 to February 4 on ClubPenguin.com and in the Club Penguin app on iOS and Android devices. . Star Wars Rebels airs Monday nights at 9pm ET/PT on Disney XD. Club Penguin (http://www.clubpenguin.com), is the #1 virtual world for children on web and mobile. Club Penguin works to maintain a fun and safe online entertainment experience by using filtering technology and live moderators. The award-winning virtual world of Club Penguin is free to use and enjoy, however a subscription membership provides access to additional features that enhance the play experience. Club Penguin, headquartered in Kelowna, British Columbia, Canada, is enjoyed by children around the world, and can be played in English, German, Portuguese, French, Russian and Spanish.